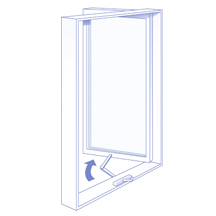 Casement windows are hinged at the side and swing either inward or outward to the left or right. Casement windows are a great choice above kitchen sinks. 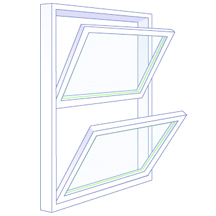 Awning Windows are hinged at the top, awning windows swing outward, allowing for ventilation even during a light rain. They are often placed over doors or in combination with other windows to add architectural interest and light. Ideal choice for above kitchen sinks. Bay Windows are traditionally a combination of a fixed window flanked by smaller venting windows at specific angles. Bay windows extend outward and are used to create a window seat or nook, open up a view, or simply add interesting space to a room. 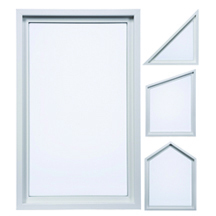 Bow Windows are a combination of a four or more fixed or vented windows joined at equal angles to form a gentle curve. Just like a bay window, a bow window makes a great addition to a living room or bedroom. 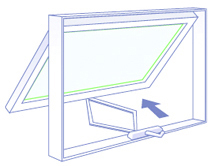 Horizontal Slider Windows open by sliding either right or left. As they do not extend outward, sliding windows are an excellent choice for rooms that are facing walkways, patios, or porches. 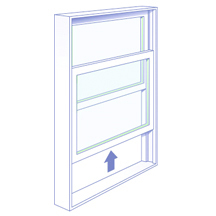 Available in a single slider where only one sash slides open, a double slider where both sashes slide open, or a triple slider where a fixed window is flanked by two sliding sashes. Single Hung Windows open by sliding the bottom sash of the window up and down for ventilation while the top sash remains stationery. 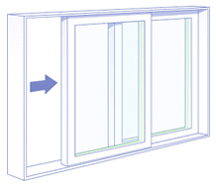 Double Hung Windows open by sliding both the top and bottom sashes up and down allowing for ventilation on the top, bottom, or both. Picture Windows are fixed windows that cannot be opened. They are usually installed in difficult-to-reach places to let in light where ventilation is not a concern. Stop by our Door & Window Showrooms in Concord and Berkeley and let our experts guide you to the right window to match your home, lifestyle, and budget.